When is an Asian car not an Asian car? I'm currently in Turkey on a mission to view a top-secret new Hyundai, and apart from the excitement of visiting a new (to me) country, it's good to see that the company's installation here appears to be going from strength to strength. From the day the first foundations were laid in 1995, to the moment the first car rolled off the line here in September 1997, Hyundai has enjoyed more ready access to Europe. Although the forthcoming car is interesting, what is much more fascinating to a seasoned old industry observer like me, is just how advanced the plant is. The compact facility, which measures 123,167sq metres, and can churn out up to 36 i20s an hour thanks to 1260 line workers and 170 robots for a total production capacity of 200,000. Although the Hyundai plant isn't on the European side of the Bosporus, it certainly feels like Southern Europe here - and undoubtedly offers all manner of European opportunities for its maker. As good Europeans, should we be describing the Hyundais we buy here as European, considering they're built, styled, engineered and developed in the region? But here's the million dollar question - should we now cease referring to Hyundais as Korean cars, but as European ones? 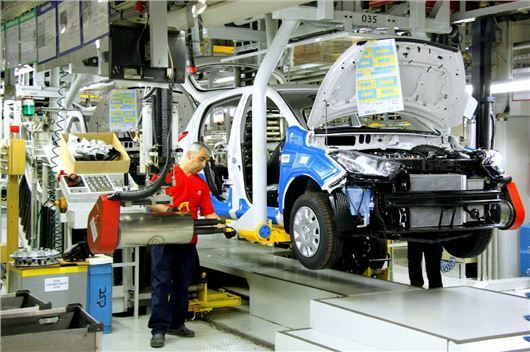 Consider this for a moment - between its Turkish and Czech factories, Hyundai has a capacity of 500,000 cars per annum, which by the end of 2014, will see 90 per cent of the company's European cars built in this region. But production and assembly is one thing, but what about the DNA of the cars themselves? Consider that Hyundai has a substantial European research and development base in Germany, and the styling and design for many of the company's current range was also undertaken in Frankfurt. So, as good Europeans, should we be describing the Hyundais we buy here as European, considering they're built, styled, engineered and developed in the region? It's food for thought, and a continual reminder that the car industry really is an international one that knows no boundaries. Well, certainly not the traditional ones that we all grew up with. Of course, there's a cultural change to consider - and if you look at Nissan, a company that's a decade further down the line of its Europeanisation, you can see where things are heading. Nissan's first car to be built at its greenfield site in Sunderland (or Washington, depending on your point of view) was the Bluebird in 1986. From those early days of assembling cars from a myriad of imported (and locally-sourced) components, the company has grown to become the largest car manufacturer in the UK. And by some margin. In 2012, more than half a million cars were built there, outstripping Italy's entire car production. Again, it isn't just a production story. Look at the highly successful Qashqai - it was styled in Paddington, developed and engineered in Cranfield, Bedfordshire, and opened a completely new market for the company. By being designed by Brits, exclusively tailored for the European market. Of course, many people won't make the British connection at all - happy to know that their 'Japanese' Nissan will be just as reliable as any other car from that country. So, it's all about globalisation, and building and designing cars in the region that their customers lie. Okay, so it's going to be decades before owners start referring to their Hyundais as anything other than Korean, but it will happen. When Henry Ford opened his Trafford Park factory in the UK, who would have thought that through the years, his cars would end up being considered as English as warm beer and cricket on a summer's Bank Holiday?